Binary Scam Alerts » Scam Reviews » QProfit System Review, SCAM QProfit System Exposed! 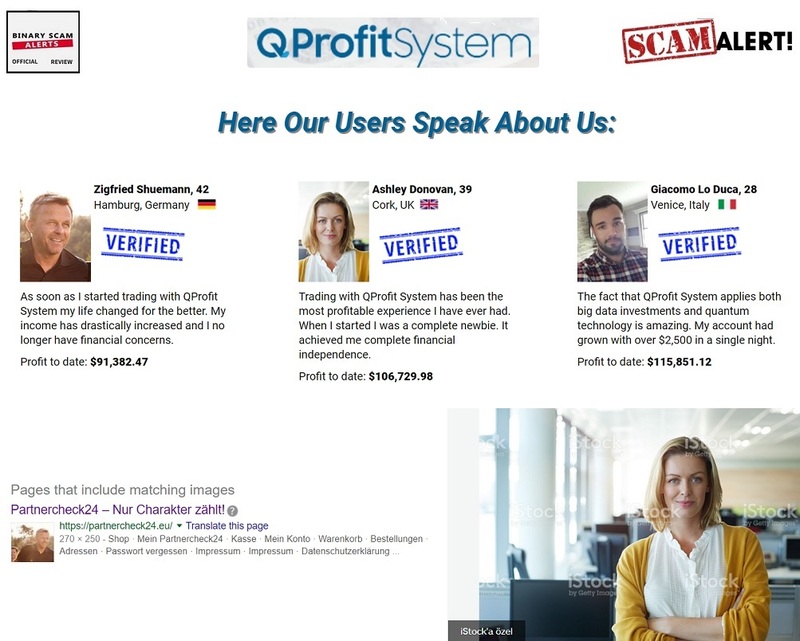 The QProfit System software and trading robot by Jerry Douglas and Sasha Petroshenko is a blacklisted SCAM, and we will prove this in our detailed and factual QProfit System review and investigation. Make no mistake, you are being led by the nose by professional con artists, and the actor portraying Jerry Douglas puts on a very convincing act. There is nothing legit or genuine about QProfit System, and it is one of the most deceptive, misleading, and manipulative get-rich-quick schemes which is being promoted online today. The crooks behind it represent the top echelon of professional scam artists specializing in credit card fraud, identity theft, software manipulation (rigged and set to lose), and tax evasion. They are extremely dangerous and masterful at stealing money, as well as highly effective at utilizing the usual baiting tactics to attract new victims. These tactics include SPAM email marketing which you can’t unsubscribe to, annoying popups, phishing attacks, aggressive click advertisements, fake reviews, and of course affiliate marketing promotions. We are here to warn you and advise you to refrain from clicking on any links, as we have received multiple complaints about spyware and viruses being installed on computers and devices and infecting them. We were also informed that thieving offshore brokers are involved and they are conspiring against you in order to defraud you and fleece your wallet. Keep reading our QProfit System review to see how we exposed these crooks and why we believe this fake app is a confirmed investment SCAM. Below is a picture of Jerry Douglas which is taken directly from the sales page. 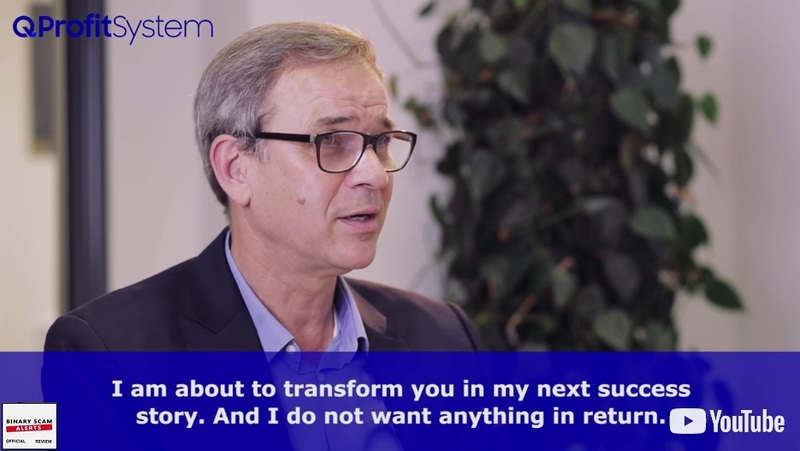 You can easily see here that he wants to “transform you” in his next success story. Below is the testimonial section of the QProfit System. Its plain to see Ashley Donovan is an image bank actor, and Zigfried Shuemann had his picture stolen from the internet. The whole testimonial section is one big forgery and lie. 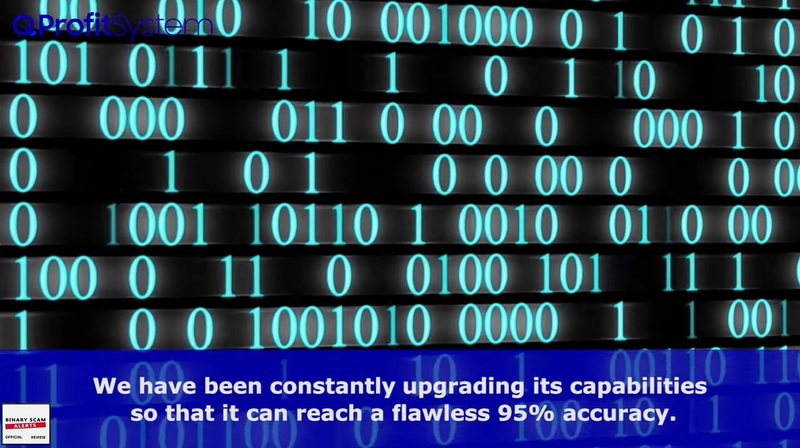 And for the final nail in the coffin, here we see the section of the sales video where they claim their software has a 95% accuracy and zero risk. That is not possible because easy money on auto-pilot means everyone can be a millionaire and we all know that is simply a hook and bait scam tactic. Financial Magic or investment SCAM? According to the sales video Jerry Douglas comes from a modest background and worked hard to support himself while attending university. He claims his bank account was consistently overdrawn but he somehow managed to put himself through college and graduated first class honors with a Masters of Financial Sciences. That led him to his first job at Goldman Sachs, where he worked his way up to and specialized in big data mining and analysis. At a certain point he understood he wanted a different kind of life, so he started thinking outside the box and came up with a solution which has already made quite a fortune for 300 people from around the globe. To really make a meaningful change he know he had to automate his financial work so he can make passive income while enjoying the benefits of his job. But, he was not tech savvy enough, and that’s when Sasha Petroshenko the Nasa engineer entered the scene. Since space exploration was not a priority for governments at the time, Sasha was immediately interested in the idea after losing his motivation to work. That’s when they met in a quiet restaurant in Dublin, and where they understood they had to combine Douglas’ financial knowledge with Petroshenko’s technological experience in order to produce a winning software. Douglas has experience in Big Data and Sasha in Quantum Speed and its importance in predicting trajectories of cosmic bodies that get close to earth. That’s how the QProfit System was born. But the start was difficult as NASA refused to let Sasha go and they had to prove he was not entering a competitive niche and no proprietary technology would be integrated into their project. So they went to court, invested their money and eventually won the day. Initially Douglas was fearful because he believed his project will be targeted by aggressive corporate interests due to the success his software achieved. Douglas claims the software achieves a “flawless” 95% success ratio and makes a minimum of $2,500 on a daily basis on complete auto pilot. Now its your time to get access to the pie only reserved for big capital investors. How Does The QProfit System SCAM Work? Quantum speed for big data analysis united by a trajectory prediction algorithm adapted to conditions of digital financial markets. QProfit System is a complex combination of big data analysis and a quantum speed technology which is able to predict future market movements with an “astonishing accuracy” level and “unprecedented success rates. Douglas claims it runs on autopilot. It’s designed for professional as well as amateur traders with little or no trading experience. He claims there is “zero risk” and everything is done for you via NASA approved prediction technology. Why Are They Giving It Away For Free? 50 beta testers will be chosen and granted access to the software before it is released to the general public through an initial public offering (IPO). He needs testers to show his success to the public. He claims he turned down an offer to sell his company for over $40 Million Dollars, but he turned it down because money is not an issue for Douglas. Not really. It’s going to cost you at least $250 to get access to this filthy software, and that money will be charged to your credit card by illegal offshore brokers who simply don’t care about your financial situation and will bleed you dry as fast as they can. The QProfit System SCAM is a malicious app and the people pulling the strings behind the scenes are liars and thieves of the worst kind. We are witnessing all the classic tell signs such as fake testimonials, inflated bank accounts, hyped up and exaggerated claims of easy money, and just outright lies and fabrications. The narrative itself is also riddled with holes and despite the seemingly sincere demeanor Douglas projects it is totally made up and detached from reality. The ones to watch out for are Bitcoin Code and Maximus Edge Autobot. If you are deliberating and not quite sure about which system is best for you it’s perfectly normal. Fortunately our staff has compiled a short yet reputable list of consistent money-making machines. These are all proudly showcased in our recommended section. The QProfit System SCAM is a fraudulent software and fake trading robot. In our impartial QProfit System review we have produced conclusive proof and evidence that Jerry Douglas and Sasha Petroshenko do not exist. Douglas is a paid actor, and we don’t even see who Petroshenko is. We can’t overstate how dangerous and insecure this fake app is, so please make sure to avoid it at all costs. If you still have doubts concerning the nature of this dubious software, please leave a message and we shall be more than willing to produce additional findings which validate our conclusions. In a nutshell, QProfit System is blacklisted and a verified financial scam so please seek alternative investment opportunities and don’t say we didn’t warn you. Don’t forget to join our Facebook Page and YouTube channel for more updates.